I figured this picture just about sums up Winter 2013.
visible even in the temperature average plot! Jim, thanks, that's an amazing plot! Newbie questions and apologies if everyone else is already up-to-speed, but is the following all true? o that aids the currents and ice flow from the direction of the Bering Strait towards, and through, the Fram Strait? Also, is it just an empirical observation, or are there known or hypothesised physical reasons? Not sure I can really answer your questions, though they may be a good place to begin a conversation. To begin with that was an anomaly plot, not a mean plot. I've attached todays plot of both from ( http://www.esrl.noaa.gov/psd/map/images/fnl/500z_90b.fnl.html ). Everything in the Arctic is low pressure by some measure. The 500 millibar height is about the bottom of the Jet Stream, if I understand correctly. My interpretation of what is happening is that the large body of open water that used to be ice covered, being warmer, is making some areas have even lower pressure and Greenland have higher pressure...and yes, moving the center of rotation for storms in the direction of Greenland. In late winter a ring of anomalous lows are producing historically unusual storminess in Europe, north Asia, and parts of North America. It is certainly shifting the wind direction, but I'm not sure the word 'dominant' applies. I'm more interested in the area west of Greenland, and I'm not too sure what is happening in the open Arctic Ocean because of this. The Siberian High has been weak and that the Arctic High has been connected through northwestern Canada to the eastern Pacific High. One could say the siberian high has moved somewhat over Greenland, while the eastern Pacific high is north and stronger than usual. thus two equally strong blocks have formed and the climatological Aleutian and Icelandic lows have been stuck for almost all of winter dumping Pacific and Atlantic (relative) heat straight to arctic. The few moving low pressure areas have thus been forced to more southerly routes creating northeasterly - easterly winds to their northside. The predominant wind direction in arctic depends, in my opinion, of the relative strenght of Atlantic and Pacific lows, further this year there has been no interfering arctic lows to speak of so the normal Transarctic Drift from the Pacific side has been enhanced. To conclude, it looks to my eye that some of the reason for the stuck weather may be blamed on the high pressure in the eastern pacific. (or weakened Alaskan storms...) Why that is as it is I've no idea. On SSW-events, I can't talk better than the resident meteorologist at the blog. Well that's how it looked meteorologically on the surface (to me anyway). I'm not sure of the proper place for the following, so here. The THC evens out the temperature differences between hemispheres in the long run. The Cold Poles (at least to me) of the Earth have been Northern Siberia (+ adjacent seas) and the Central Antarctic. Now as the Arctic sea ice is diminishing rapidly, there has been some changes in the atmospheric circulation in the Northern Hemisphere. One of the changes this past winter is described in the image provided by Jim Williams in the OP (opening post), the slight movement of the arctic high pressure areas over Greenland. As the atmosphere is physically a very fluid system (mixture of gases) the changes progress over the entire surface of the planet way faster than in the not-so-fluid system (liquid oceans) on this gravitationally bounded isochoric system called 'substratospheric Earth above the mantle'. Now I'm not big on numbers and maths and physics, I rather like to think by balances, be it physics or ecological relationships, so wouldn't the previous lead to a logical conclusion? As and if the Arctic high pressure switches location to the Atlantic side permanently, the Antarctic High Pressure area should in short time move somewhat more over the east Antarctica. This imbalance created by the Greenland Ice Sheet, while it exists, might also twist the ITCZ so it would be more in the north in the Pacific sector and more south in the Atlantic/Indian Ocean. This is pure speculation of course and idealizes the atmosphere - land -ocean relationships (water-planet model with only low islands + the asymmetrically located ice sheet (GIS on earth)) so the effects might not be noticeable in the real system Earth. But anyway, someone might want to check from the meteorological records if this potential 'atmospheric seesaw effect' exists in the real world. the latter one should probably have a Lambert Azimuthal as the earth to be more accurate"
I think I've attached the plot for Antarctica's last winter (approximately) corresponding to my plot for the NH. Not sure what it might mean. In fiddling about I tried 1000mb (sort of like sea level) for the Northern Hemisphere for the same dates as I'd used for Antarctica above -- and was rather surprised at how visable the anomaly is. This would be last Summer -- with hurricane Sandy and the rain over Britain, and I guess the GAC. Thanks, the southern anomaly isn't where i thought it might be. So it's not that simple. But maybe there's some correlation still between the polar areas, that deep anomaly on the tip of South America might be an opposite pool for the Greenland anomaly, but as for the mechanism mediating this, I can't yet say (if ever). Me neither - and where has Greenland gone? He isn't going to win any awards for plain English, is he? I love Wayne like a brother, but i think sometimes he gets a little loopy from the long polar nights and days in Nunavut, Canada's high Arctic territory. I credit Wayne with first introducing the Cold Temperature North Pole on the ASI blog in September 2012. Wayne just has that 'left-brainy' way of seeing the world with fresh eyes. I just try to keep up! I looked yesterday to see if Wayne Davidson might be registered as a User yet here at the ASI Forum, but the only 'Wayne' i see is our other friend Wayne K.
Apologies if i missed you, brother. I recently described our new off center cold pole as akin to an unbalanced wheel - both capable of inducing a bumpy ride ahead. Recognizing that it's trite, is there anything fundamentally untrue about such a comparison? I should point out that the pattern I'm talking about is a summer pattern. This winter's pattern is a Warm Arctic Cold Continents pattern due to low index AO. I'm not sure the two are in anyway related, WACC patterns have occurred long before Arctic sea ice loss. It's just that the sea ice loss is driving a pattern that is like the low index AO. With regards the summer pattern, about which Wayne has proposed an idea about the cold pole shifting to over Greenland: I'm struggling to find a simple explanation, until I understand the mechanism I will not be able to give one. I have some sympathy with Wayne's cold pole idea. However the geopotential height well still centres clearly on the Arctic ocean, and I still see this as an important problem with Wayne's view. I need to explain. The scale is in metres, so over the UK GPH for 500mb was around 5600m, Over the northern states of the US it's around 5800m. You can see that the GPH drops towards the pole because the atmosphere is thinner over the polar regions. Now the centre of action of the new summer circulation is over Greenland. 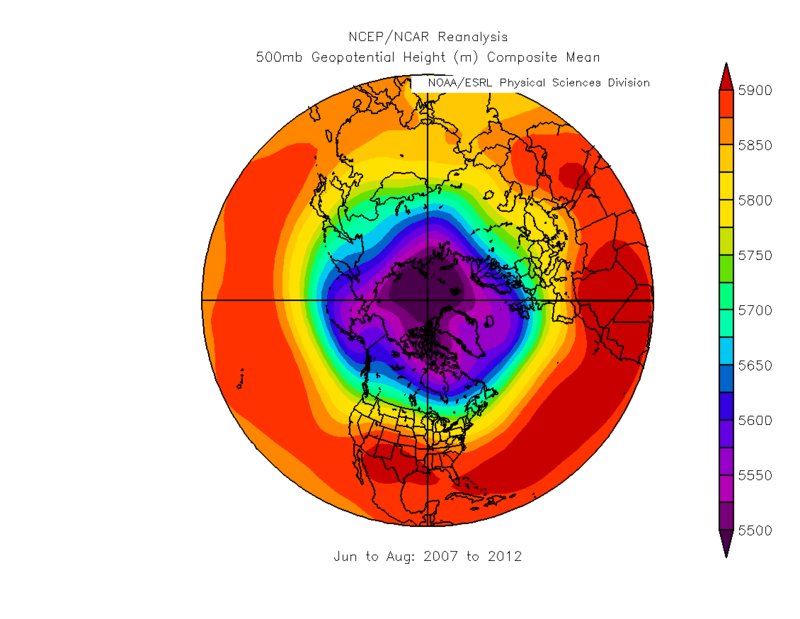 From the GPH plot it can be seen that there is a ridge of GPH over Greenland. There always has been a ridge, but it is now about 50m higher than typical heights pre 2007. But it is clear that from the point of view of GPH the centre of action remains over the ice pack, not over Greenland. The Jetstream flows around the GPH well. This GPH ridge is the cause of the new summer pattern, what causes the ridge is not known with certainty, it may be due to Eurasian snow retreat, but there may be a role for Arctic sea ice loss and formation of low pressure over the Siberian coast. I suspect that once the ridge is formed it creates connections with a region around it (3000km distant) via atmospheric waves which drive the formation of a belt of low pressure tendency in response to the Greenland GPH ridge.